The league round to be held in Crookstown tomorrow (Sunday June 24) has just been cancelled. Their field is waterlogged!!!! Sorry for short notice, but we only just found out. We are postponing our Open Sports Day tomorrow (Sat June 23) due to the recent bad weather. We will still be holding activities for the kids, including our kids' agility challenge (at no charge) so be sure to come down and bring the kids!! Round 2 Kildare Track & Field championships juv,sen, masters due to take place this Sunday have been postponed until 8th July 2012. Event will be hosted by Celbridge AC. Click here for more information. 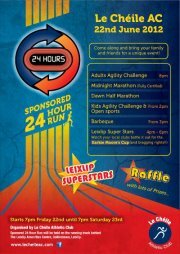 Our 2nd 24hr sponsored run will start on Friday June 22nd at 7pm on the track. This event will go on for the next 24-hours so come on down and get involved. There are loads of activities planned for little kids and "big" kids and your support is always welcome! See you then!! Well done to all athletes who competed in the Leinster Championship team event today in Celbridge. We had 4 teams and all performed very well. The Under 11 girls came very close to qualifying for the All Ireland finishing in 4th position. Our athletes in all teams performed particularly well in the 4 x 100 relays. Thanks to all partents and supporters who attended and well done to Celbridge AC for what turned out to be a very well run event. Important we have a big turn out this Wednesday to maintain our position at the top of the Kildare Juvenile Track and Field League. Its on in Crookstown and the start time is 7PM. You will need to allow 1 hour from Leixlip. Looking forward to seeing you all there, anyone with difficulty gettng there let us know at trainng tomorrow and we will sort something out.